A few months ago I reviewed a nice toy app from Toca Boca, entitled Toca House. As a parent, I'm grateful that the app exists, because it helped my sons learn about the different parts of the house. The app also helped them learn about various chores and appreciate the people who are doing it at the moment. Today I will share about a brand new app, PlayHaus, that offers a deeper look into the different parts of the house. This app also offers a playful and colorful approach to make the experience fun and appealing. The game starts by placing blocks of various shapes and colors into a grid to form the rooms of your house: garage, living room, library, kitchen, dining room, bathroom, play room, outdoor, attic, and bedroom. You can rearrange these blocks anyway you like and tap on them to change their colors. Once you're ready, tap on the next button to watch each block become a room of its own. These rooms will preserve the shapes of their building blocks and their border colors. You can also tap each room to explore, interact, and play with the things inside that room. For example, if you enter the kitchen, you can play with the juicer, toaster, and colorful drawers. When you enter the dining room, you can tap on the square lamp to show only square objects. Similarly, you can tap on the triangle and circle lamps to show objects of those shapes. The app also introduces interesting objects, such as utilities installation and gemstone miner, in the underground part of the house. It is also possible to go to the attic and observe the sky both at daytime and nighttime, learn to sort out toys in the play room, and many more. When building your house, you're probably tempted to set it up as realistically as possible. But since the house width is limited to four blocks only, you're bound to stack up the rooms anyway. The rooms are not randomly generated by the app. Instead, they are static. For example, the L-shaped blocks are always for the garage and the outdoor playground, whereas the triangle blocks are the attic and the library. You should be able to recognize these rooms after playing the app for a couple of times. I really like how the app allowed me to talk with my eldest son, Philip, about how he wanted to build his next house. We also discussed about how he wanted to organize his new room. I also used the app to reinforce the names and functions of each room. For example, I would ask him to find the room where we have our meals, or where we take showers. He would find these rooms and say their respective names. 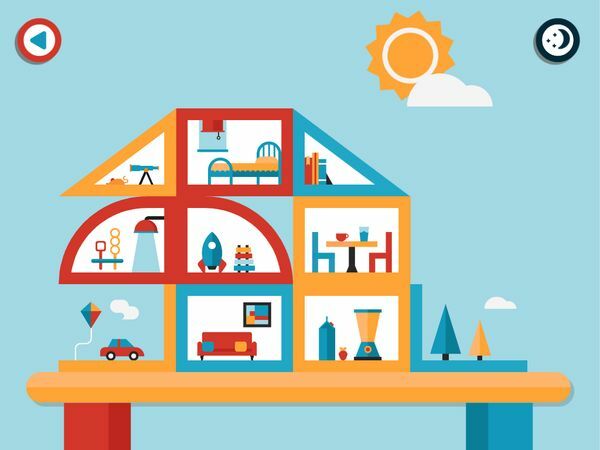 PlayHaus is a beautiful toy app that lets juniors build and explore their own houses. It also helps them learn about colors, shapes, group related items, and many more. It's a fun app, and I would recommend it. Get PlayHaus on the App Store. Thanks to the wonderful folks at OopsYay for sharing the app with us. Both my sons and I really enjoyed it. Tomo House. Interactive game lets juniors form letters and words from uniquely-shaped blocks. Toca House. Colorful app brings out the fun and rewards in housekeeping and completing chores. Alex the Handyman. Playful app invites kids to fix things around the house.